The original restorative conferencing training received by the Restorative Justice Program was conducted by IIRP Latin America, and the conference script used in the program is based on the IIRP’s Real Justice conference script, which provides a format for bringing together victims, offenders, their families and respective communities of support to explore the harm caused and ways to make things right. In addition, the Costa Rica Ministry of Justice was recently awarded a one million Euro grant by the European Union to strengthen its Restorative Justice Program and support similar programs in Mexico and Colombia. 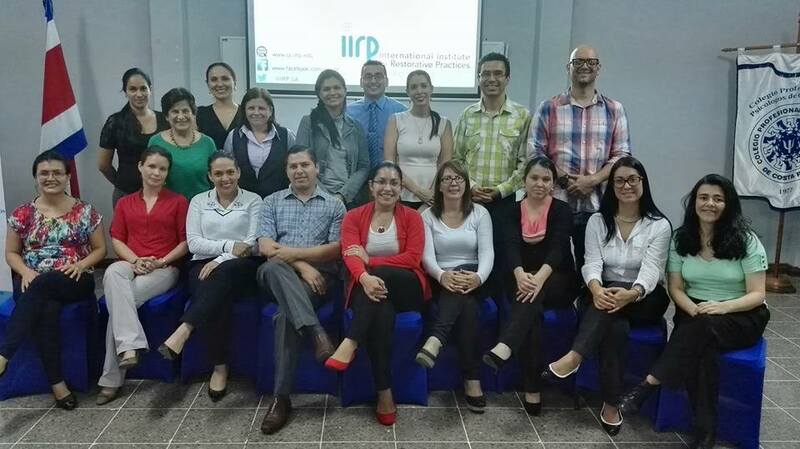 And as IIRP Latin America’s Representative, de Mézerville recently attended an event about another project directed by Magistrate Arias and the Costa Rica Restorative Justice Office called “Access of Justice to Youth with Drug Problems,” for which IIRP Latin America provided training in 2015. Through the Student Life Department of Costa Rica’s Ministry of Education, IIRP Latin America will have trained by the end of 2017 more than 200 teachers to facilitate circles and employ a restorative philosophy in their classrooms and schools. Small teams of three to five teachers from different schools attend the trainings and apply their learning, with follow-up session for teachers to share their experiences, ask questions and reinforce their skills. Training with Costa Rican psychologists from the Center for Conflict ResolutionCIREC (Center for Conflict Resolution), a branch of the Association of Psychology Professionals in Costa Rica (Colegio Profesional de Psicologos de Costa Rica) is partnering with IIRP Latin America to provide training and conflict resolution services. Member-school psychologists trained to facilitate circles have been taking their skills to schools and organizations. 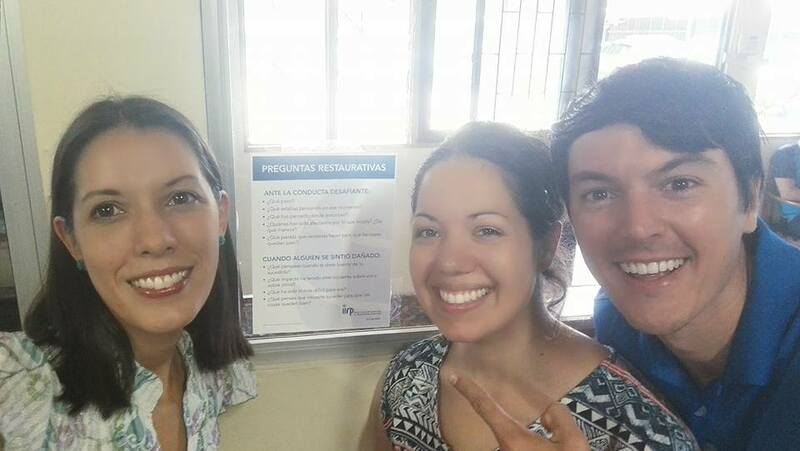 Liceo de San Rafael (San Rafael High School) in Alajuela, Costa Rica, one of the country’s high priority public high schools, has embarked on a whole-school project to embed restorative practices in its school culture in an attempt reduce school suspensions. This is a joint project funded by the Strachan Foundation and includes Fundación Acción Joven (Youth Action Foundation), the U.S. Peace Corps and IIRP Latin America. De Mézerville was trained as an educational psychologist and has been an IIRP licensed trainer since 2011. As a professor at the University of Costa Rica Faculty of Education, de Mézerville has been working to incorporate restorative practices in the curriculum for all teachers and has fostered a culture where faculty are implementing the systemic use of circles in their university classes. De Mézerville with U.S. Peace Corps volunteers working on the restorative practices project at Liceo de San Rafael.As Representative, de Mézerville is the primary point person of contact for IIRP Latin America. She takes over for Miguel Tello, former Representative for IIRP Latin America, who will continue to remain involved with the IIRP. Tello pioneered the use of restorative practices in Latin America, bringing IIRP trainings to Costa Rica and the region starting in 2006. As a new member of the IIRP Graduate School Faculty, Tello will teach the online course, Restorative Justice: Global Perspectives. And as director of the Strachan Foundation, a charitable family foundation that has allowed Tello to provide restorative practices training to interested nongovernmental organizations throughout Central America, he will continue to provide support and training. This summer, Tello will begin offering online professional development in restorative practices, delivered in Spanish, to teachers from Guatemala City, with funding from the Strachan Foundation. He is also exploring a partnership with Universidad Javeriana, a Jesuit university in Cali, Colombia, to offer restorative practices training that will be incorporated into their master’s degree in restorative justice.